Vineyard House, a 19th-century Victorian in Coloma, the community where James Marshall struck gold at Sutter's Mill in 1848. After that, a lot of fools rushed into California. When you enter the fog of Coloma, California, in the heart of the gold rush country of the 1800’s, anyone with any psychic ability can feel the tingling of lingering spirits. You know with certainty that the hauntings here are real, and that your imagination is not playing a part in the stories and accounts that you have been told and feel. A walk down the path of yesterday is certainly one of goose-bumps and exceptional recounts, and such is the history of the VINEYARD HOUSE in COLOMA. 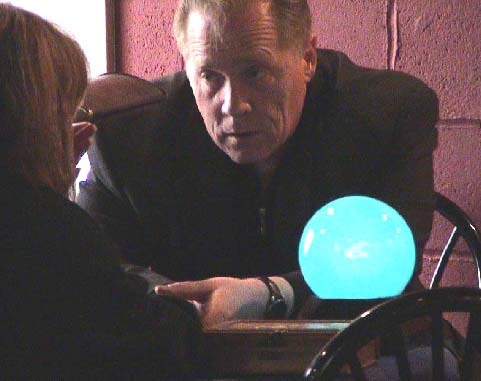 The Celebrities Psychic NANCY BRADLEY along with Paranormal Investigator SHANNON MCCABE know this more than anyone. They have experienced the energy. Between owners, the VINEYARD HOUSE MANSION lay vacant. The beautiful Victorian was dark, dismal, going in to disrepair. Then someone would lease or purchase the building, and with a little paint it would be re-energized with history once more. Then, again, between residents, it became dull, dark, and imposing once again, making it and its history a treasure for ghost hunters. It was during one of these recent times that a woman witnessed a strange occurrence inside the mansion. She was driving up the hill along the two-lane country road in front of the mansion, and saw a light on in the upstairs bedroom. She knew the house had been vacant and boarded up for some time. Glancing up, she saw a woman looking out the window. “Did you see that women in the window?” she asked her daughter. The daughter nodded in the affirmative. “I am going to go back and see what’s going on,” her mother said, and at that time she pulled over and got out her cell phone. She called me. Intrigued once again with the VINEYARD HOUSE, I got out of bed, dressed quickly, and hopped into my car to drive down the hill. The woman turned her car around and drove up the driveway. The building was dark. Spooked by this time, she did not stay around to ask questions. It certainly gave her and her daughter something to talk about for days to come. I got to the winding cliff-side road in time to see the light go out and the beautiful woman in the window close the curtain. How sad for this entity. The electricity had been turned off a year prior. Another similar incident around that same time involved people going to an evening performance at the Olde Coloma Theatre which sits just below the VINEYARD HOUSE. Several people saw lights flick on inside the house. They saw that the building was roped off and unoccupied, and being residents of the area, they also knew the lights had been shut off a long time ago. They notified law enforcement. Having written the book Incredible World of Gold Rush Ghosts and a known paranormal personality in the community, I was called once again. When the authorities arrived, their investigation proved the mansion was still padlocked from the outside. No indication of entry could be found. To be certain, someone with a key was summoned to open the door. The building was dark; the lights long shut off by the electric company. A thorough search was conducted by flashlight. No one was found hiding inside – at least, no one living the authorities could see! It posed the age-old question: Why do spirits haunt some places and others? Contrary to some belief, it has been my experience most apparitions are not associated with cemeteries but places they knew in life. Would you want to remain with rotting remains? How morbid it would seem if you had other options! Ghosts to my experience are often earth memory akashic images, animated astral body shells, spectral thought forms. You cannot communicate with them, they are like videotape of when someone was there, but the actual entity or soul has gone on. The deceased seldom display any interest in their decomposing physical bodies to my experience. Nor are they interested in their ashes in urns. You more likely find them in places they knew in physical life. These are usually dwellings, homes, hotels, pubs, office buildings, factories, or aboard ships, cockpits of airliners, roadsides, and along waterways. This is what makes ghost hunting so much fun, as we explore and look for evidence of those gone by. We had explored it before. Today it is being resorted (once again) to its’ old glory. The VINEYARD HOUSE rests on a hill overlooking the small hamlet of Coloma. It is a four-story structure, with nineteen rooms, nine fireplaces, and it is encircled by a porch with a second-floor balcony. The style is Victorian. The interior contains a large ballroom. The basement is mostly red brick. It was build in 1878-79, erected to withstand the many years to come, sturdy and solid. But the story of the VINEYARD HOUSE began years before. It is the story of two men whose lives became strangely entwined and who both experienced deplorable deaths. It is the story of Louise, the woman whom they both loved, and it interplays with lives, both happy and tragic. Martin Allhoff and Robert Chalmers came to California during the rush of gold seekers hoping to make a strike in the fields of Coloma. Mildly successful, they found some hard-earned gold but acquired no great wealth. They both worked at odd jobs to supplement their findings, with the hopes of traveling back east. They both exited California for Ohio in 1852. While back in the Buckeye state, Allhoff married Louise Wever, a fourteen-year-old girl. He then brought his bride across the country and back to Coloma. Chalmers returned also. Disillusioned and unable to make a substantial gold find, both sought to end their days in the gold fields. The difficulties of gold mining, bloody hands, broken bones and beaten bodies were not for them, especially for meager rewards. The two men decided to engage in other occupations. Allhoff purchased a small portion of land that he eventually added 160 acres onto, and became a vintner, Chalmers an innkeeper down the street. Chalmers had plenty of room for grapes and he planted vineyards. Over time the winery became one of the finest and most recognized in the state. All seemed well. And then the bomb fell! Allhoff’s was arrested for tax evasion and liquor license violations. Depression reached an endless abyss and one morning as dawn was beginning to light the eastern sky, he took his tortured mind to an outhouse where he committed suicide. He was buried in the Old Coloma Cemetery, within sight of the VINEYARD HOUSE. About this time Robert Chalmers was looking for new adventures to explore. He immediately began to court the lovely dark haired Louise who had inherited the vineyard cellars, and the other assets of her late husband. Together they built a vineyard empire, and in 1878, nine year after their marriage, Robert Chalmers began to build his dream house. He would call it the VINEYARD HOUSE. On April 4, 1879 upon completion, a grand opening was held and large crowds of the elite partied and participated in the festivities. The VINEYARD HOUSE became a popular social scene for those who those had found riches and wealth in the gold fields. In the ballroom lucky ladies in the best ball gowns and jewelry danced with groomed men, one of which was a famous guest, the former President Ulysses S. Grant. Historic events of the gold rush were celebrated at the VINEYARD HOUSE. All was prosperous and lovely. And then MORE bad news came, as an insidious menace as relentless as a burglar in a high-class New York neighborhood. Only this one was unstoppable. It began with Robert Chalmers loss of memory. Then he began acting strangely, fighting with the household staff and the children. He was entering a realm of madness. He soon took pride in watching the graves being dug in the Old Coloma cemetery across the street. Soon as the hole was ready, he would slither over to the cemetery and lie himself in the open graves with his arms crossed over his chest in the traditional position. His family and staff would have to restrain him and bring him back to the mansion. Frightened for everyone’s safety as the madness increased, Louise had a cell with iron bars constructed on the basement of the VINEYARD HOUSE. It is still visible today. She coaxingly convinced her husband inside, and shut and locked the door behind him. Here, alone in the solitary world of cold damp brink and his own demented illness, Chalmers’ drifted into the crazy darkness that he was destined for. He writhed and moaned long into the evening, crying out, banging his head against the bars that held him captive. Eventually he lost his eyesight and mumbled incoherently as he moved about in his black, miserable cell. After a while he refused food and starved to death in 1881. A friend had come, and it was called death. Some say Chalmers suffered from the final stages of syphilis. From a psychic perspective I know it was Alzheimers. Alzheimers disease is an extreme form of senility that attacks the central nervous system, thus causing disorientation and then degeneration. This was his fate. For Louise the death of her husband could have been nothing but a blessed relief, and she managed the vineyards well having learned from both her husbands, but alone she could not pay off the creditors. After years of fighting and litigation, she lost her VINEYARD HOUSE to her creditors, but a judge allowed her to remain in the house on a non-paying basis. The cell in the basement was rented out and used to house prisoners about to be hung by the huge oak in the courtyard, their bodies then also taken to the cemetery across the street. When renovating the VINEYARD HOUSE, one of the subsequent owners was to find an old wooden casket in a crawl space still waiting for a prisoner. Louise died in 1900 taking her memories with her, good an bad, to her grave across the street. Strange occurrences immediately became commonplace at the mansion. Robert Chalmers, although dead refused to leave his dream home. Tenants now complained of mysterious noises, the sounds of ghostly footsteps and things being thrown around, echoes along the corridors. Boarders fled in the middle of the night so frightened they would not stay on one more moment. “I thought I knew what I was getting into when I purchased the Vineyard house” Gary Herrera told the author. When he owned the building Robert Chalmers’ spirit would bang on the walls when aggravated. His spirit took pride in annoying my guests that did not meet his approval. Herrera eventually sold the VINEYARD HOUSE. Other owners complained of beds newly made by staff being torn down by unseen hands. Staff would be locked into the restroom by those unseen. Some guests, newly tucked into their beds at night would hear and then watch someone open their locked bedroom door, walk in and sit on the bed beside them. Unseen feet would make noise on the stairs as the approached the landing. The kitchen was another matter. Pots and pans would be all thrown over the floor in the morning having been put tightly away the night before. The Coloma community has many stories to tell about the VINEYARD HOUSE, they accept without question that it is haunted, and the GHOST GIRLS have stepped up the plate. We will share more with you as time goes on. The VINEYARD HOUSE is a great experience in ghost hunting if you watch it from the cemetery across the street where Louise, Chalmers and Allhoff are buried. Please do not bother the new owners the VINEYARD HOUSE is now a private residence. GHOST GIRLS would love to take you along on their next excursion so you can get the full and complete scoop. The VINEYARD HOUSE is a sordid tale of wealth, greed, luck, bad and good, love, insanity, and death. What more could ANY ghost hunter ask for! And, GHOST GIRLS are on it! NANCY & SHANNON will be sharing further adventures and updates of their experiences at the VINEYARD HOUSE and in Coloma shortly. Excerpts for this article have been taken from the book INCREDIBLE WORLD OF GOLD RUSH GHOSTS by the Celebrities Psychic NANCY BRADLEY.